Here are the three panels that I started last week with the thick and straight-from-the-tube colors. 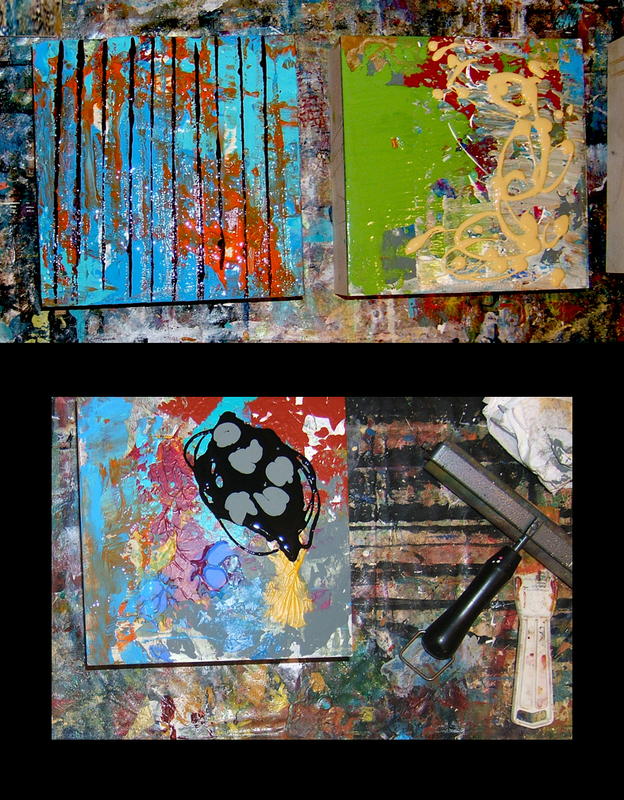 Now I’ve squeezed, smeared, dripped, and piled on more paint and more thickness. If I use a brayer or a squeegee, I always clean them off on a piece of paper, with the idea of hanging onto those scraps for collage. The squeegee in this case is a long narrow piece of foam board. I’ll keep using that until it has a lot of coats of smeared paint. Then I’ll look at it to see if it’s getting interesting. 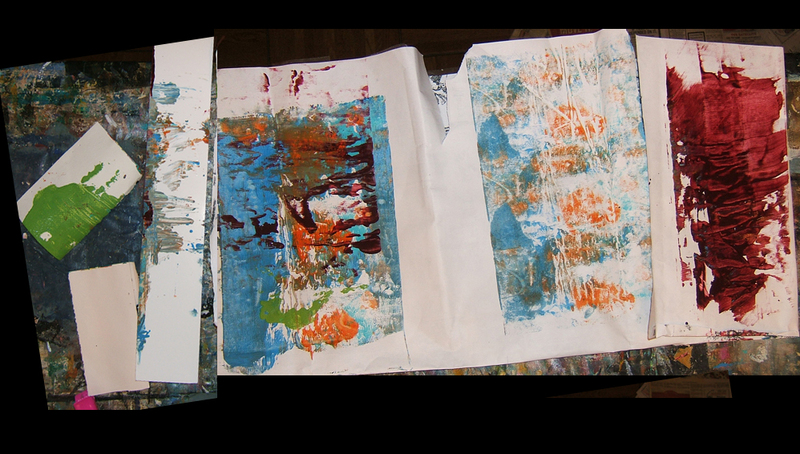 and the second one shows what my papers and my squeegee look like after smearing the excess paint on them. Who knows? These might become paintings too! There’s a lot of drying time in between thick coats of paint. So now we wait to see what comes next. Sometimes when you aren’t quite sure how to proceed, it just feels good to make a mess. It’s by doing that we are shown what to do next. I have just found your blog by Googling ‘Artists Blogs’. I find your painting inspiring and the way you approach your work seems similar to the way i used to a few years ago when i was painting. Life then took some disruptive twists and turns and i am thinking that by following your blog i might be inspired to make some space in my house and my life to take up my paints again. Sandra, I’m so happy you landed here. I hope you’ll click on the tags in the sidebar where you’ll find other posts to possibly get your wheels turning. And yes, you can take up the paints again! I hope you will. thanks for the encouragement Martha! Regina, if you’ve been down a similar road, you know they might not turn out to look anything like this in the end. I was thinking in the middle of the night about it, wondering how much of that brilliant (and thick!) paint will get covered over. But I felt that if I didn’t just do something, nothing was going to happen at all. Thanks, Bren. Maybe I’ll just keep posting all the twists and turns with the three of these. But sometimes it gets interesting, and sometimes lands with a thud and I have to start over. Oh well. 😉 Glad you like the papers.